After the business trip, as hard as it is, I need to face the reality that I’m not a luxurious traveler and that I will have to give up my little piece of heaven in Marriott Champs Elysees and transfer to a more down-to-earth level of a hotel room in Campanile Tour Eiffel Paris 15. 1. Good reviews from previous guests (I’m always looking out for reviews about the cleanliness of the room and the bathroom). Well, the property couldn’t have fit those qualifications better as it had good reviews in both booking [dot] com and tripadvisor, it is affordable and the location is absolutely perfect. I can see the Eiffel Tower as soon as I get out of the building. The nearest metro station is the Dupleix station which is about 5-10mins away from the hotel by walking. I actually noticed at the time that Paris is a very well-connected city and you can find a metro station in just about anywhere. So going to all the places that I’d like to visit wasn’t really a big hassle for me. The area as well is very safe, I never felt threatened even if I’m walking all by myself at night. The staff all speaks perfect English and very helpful too. I did not book a breakfast so I wasn’t able to try it out. There’s a bakery across the street and a cafe just beside the hotel which is where I mostly go for breakfast. The web photos though are a bit misleading. Well not a bit, it IS misleading since the rooms did not look like the ones they have published on the internet at all. On the first night, we took a twin room since a colleague of mine joined me. The twin room was too small even for 2 Asian girls. We did not have any room for our luggage and it’s hard to go around the tiny area. The toilet is too cramped as well, so cramped that I had to sit sideways on their toilet bowl to fit. LOL. I transfered to a single room for the rest of my stay which is of decent size, for one person at least. 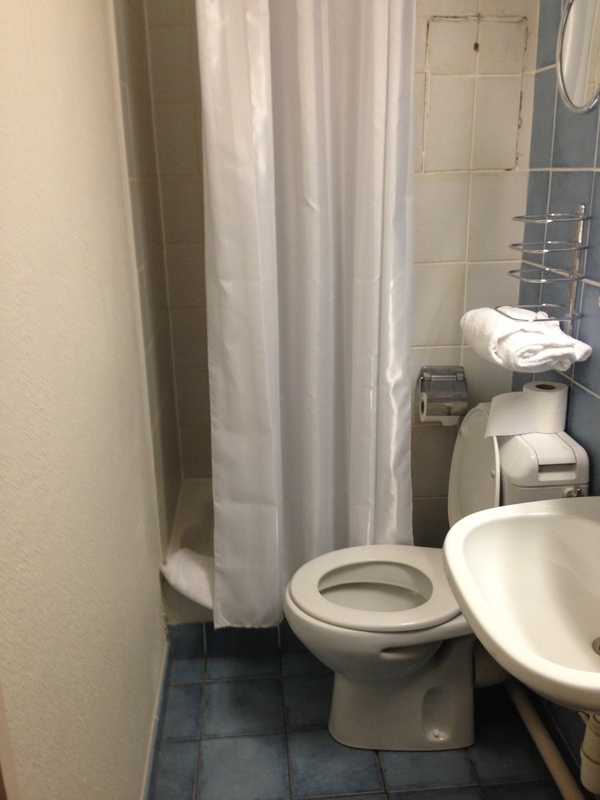 Although I still had the same problem with the bathroom being so cramped. Amidst the size, I still liked it since it’s clean. I couldn’t complain on the cleanliness of the whole property in general. What I really liked about the hotel though is the neighborhood that it’s in. It’s a residential area but very quiet. I slept with the windows open to let in some air and I never had any problems with the noise at night or even in the morning. I usually leave the hotel at around 9am though so I’m not sure if it gets crazily noisy after that time. Will I recommend it to other travelers? If you have the same requirements as I have for a hotel property, yes definitely. Will I ever stay there again? After staying in Paris for 5 days, I somehow got to know the city better. I’ll probably stay closer to the Opera or Bastille or maybe even stay in Montmartre area which I have tried to avoid for this vacation since I’ve read a lot of mixed comments about the safety issues in that place but found that area quite ok. 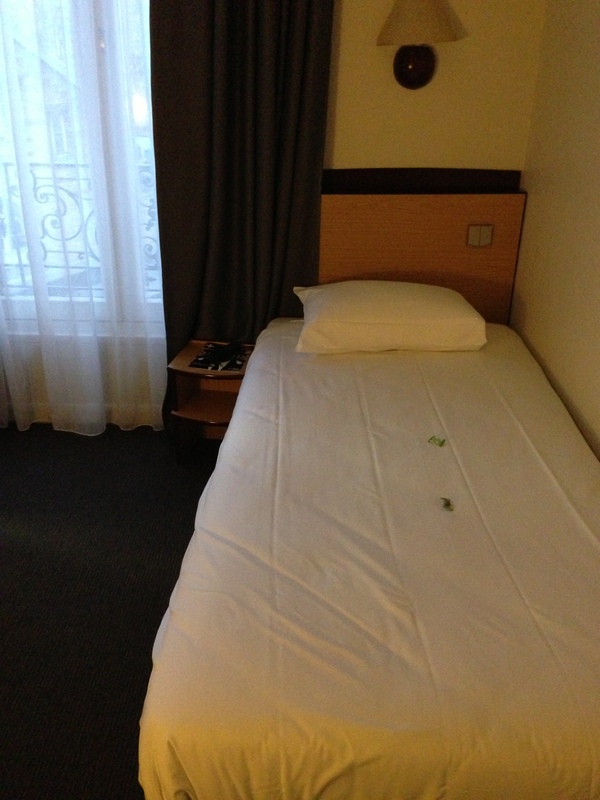 However, I really don’t mind staying again in Campanile Tour Eiffel.